There are various strategies that can be used to help you when solving number square puzzles. The first one is simply to be ordered in the solving process: start by writing down the numbers from 1 to 9 and then cross them off as you use them. Sometimes the puzzle will have given numbers at the start to eliminate accordingly. There are various rules that you can use to help you reduce options. If 'n' is an odd number, then you know that a,b,c must all be odd, since if any were even then the result of the multiplication would be an even number. In a puzzle with only nine numbers to slot in, working out these must be 1,3,5,7,9 and eliminating the 2,4,6,8 from those cells is a very useful piece of information indeed. There are various other simple rules that you will work out that apply to various sums as you start solving these puzzles, and it is fun to find these out and to apply them. Look at particularly low values and high values too, as often there may only be one way to find them. Imagine that a x b x c = 224 for instance, then you know that a,b,c must be 8, 4, 7 in some order. Remember that when you have three cells with these pencilmarks, 478, 478, 478 then you can eliminate those numbers from all other cells in the puzzle. Similarly of course if you were to have 47, 47 in two cells and so on. When you start solving the puzzle if nothing jumps out at you instantly, look at each sum and see if there is one that has very few options. If you can think of lots of possible ways of doing a particular sum then that is probably not the best starting point into solving that particular puzzle. Remember to look carefully at numbers that are negative as well. 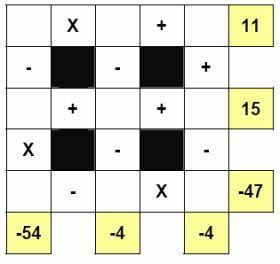 If you have 'a - b x c' such as in the first column and final row in the puzzle shown here, then you know that the result of a - b must be negative. This tells you that b < a, in words that the value of b is greater than a. So of course 'a' cannot be '9'. And you can see that 'a' infact cannot be larger than 3. There are various little rules and tricks that you will pick up whilst solving these puzzles. Feel free to share any that you come up with below!